Where did Color go wrong? 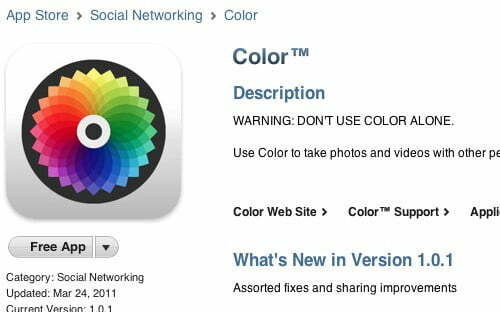 Photo-sharing app Color debuted a mere three months ago and already it’s being passed off as a momentary fad. When it first launched, it set the digital-social world on its toes and got us all throwing around words like “game-changer” and “revolutionary.” Color was supposed to become the new M.O. for social networks, a way to concretely combine mobile, location, social, and photo. Maybe it was ahead of its time and maybe it was a whole lot of hype – whatever it was, Color seems dead in the water. President and co-founder of Color Peter Pham has left the company, according to AllThingsD. A number of things have contributed to Color’s ever-mounting missteps, but Pham’s jumping ship is a significant factor and one that may finally convince everyone Color is not the new wave of social networking. So where did Color go wrong? In early April, Robert Scoble sat down to interview Pham and co-founder Bill Nguyen. They admitted Color’s launch was a squandered opportunity, saying “We threw out a network you don’t know how to get good at…We threw a mountain at people.” The “brand new UI paradigm” coupled with an entirely new (elastic) way of thinking about your Internet identity and social circle proved momentarily intriguing and altogether too much for people to entirely jump on board with. Pham previously worked at Apple and said he wanted to mimic the simple, self-explanatory UI of its products. But this didn’t work with Color, which is such a departure from its genre that the lack of instruction simply isolated users. The rabid media attention from its $41 million round of funding also didn’t entirely benefit Color. Nguyen explained to Scoble that investors from Sequoia were so impressed by Color’s concept that they wanted to speed up the process and asked how much money that would require. The answer: $41 million. That amount of money from such a prestigious firm to a completely unknown app is bound to get some hype, and get some hype it did. But it seems like it was all too much too fast and the public expected too much from Color’s initial launch. This resulted in an admittedly high churn rate – meaning hoards of people downloaded the app, gave it a shot, and then quickly dismissed it and deleted it. Swiftly after its launch, Color had two stars. Today, that rating hasn’t changed. When Color launched, some were bold enough to say we’d finally seen a Facebook-killer. Of course, these were the easiest converts, but more specific networks like Instagram and Path had a little more to be wary of. And the fact that Color’s introduction coincided with SXSW added a little scare for these mobile-social companies. Fortunately for them and unfortunately for Color, turns out any apprehension was unnecessary. These apps have continued to grow, some at astounding rates, and Color hasn’t challenged their user base. In fact, the various mistakes Color made in its launch aided its would-be rivals: Consumers were put off by the unfamiliar UI and overwhelmingly unique concept behind the network, pushing them back to the comfortable waters of Instagram and other similar services. Of course, the fact that iOS 5’s Photo Stream and Facebook’s forthcoming photo app are launching in the midst of Color’s struggles put it on shakier ground. From what we’ve heard about Facebook’s new project, it combines Path, Instagram, Color, and With. And seeing as Facebook has established itself as the most popular place to share photos as well as the world’s top social network, it’s fair to say it could easily crush the competition. Is there anything to salvage? Color may not have had the best marketing team or launch scheme. It may not have had the goods to trump competition or the resources to adjust its infrastructure quickly enough. But there is one thing it has that maintains the potential to change the mobile-social market: Its technology. Color’s elastic social network is remarkable, and its multi-lens function that uses proximity algorithms to find other Color-using smartphones is patent-pending. In essence, Color created the idea of a social camera: Taking a photo is more than just taking a photo. It takes into account the audio profile of your location, captures the compass reading, and can find who or what (device) is around you. This technology could easily become implemented in a variety of other mobile-social apps, and we wouldn’t be surprised to see competitors attempt to integrate similar functions into their own products. If Color does fail, the one positive takeaway would be that it could see profits from this patented technology from the very entities it once tried to take down. It’s a small coup, but it’s one nonetheless.